These Destiny 2 wallpapers show off one element of Destiny that needed no improvement for its sequel: that fantastic art direction. 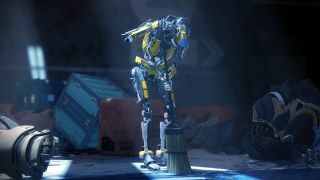 Bungie shared the new images on its site in celebration of Bungie Day (July 7, corresponding to its weird obsession with the number seven) and they show off new Guardian armor, happier times in the The City, new worlds waiting to be explored, and of course, every Guardian's dearest ally: Sweeper Bot. Click the button in the upper right corner to see the full-sized versions. Head to Bungie's site if you want 4K or mobile versions. Though the mobile Sweeper Bot one is so perfect that I just have to share it here too. Read through our Destiny 2 hub article for all the info you need and watch the Destiny 2 beta trailer for more details on what you can play ahead of the launch date.